Remember that moment in Big when Josh raises his hand and says, “I don’t get it.”? I love that scene. (You can watch it here.) It so perfectly captures the 1980s, and the genius of a child’s mind. I had my own Big moment here at home the other day. Jack had asked to make cookies, and so we found a recipe for Lemon Raspberry-Jam Thumbprint Cookies from our Feeding the Whole Family Cookbook. We modified the recipe based on what we had in the pantry, and came up with a nice, soft whole-grain dough. And as I was dutifully showing Jack how to form a bit of dough into a ball, flatten it into a circle, and then use my thumb to make an indention for the jam, he was politely ignoring me. Which is positively genius. 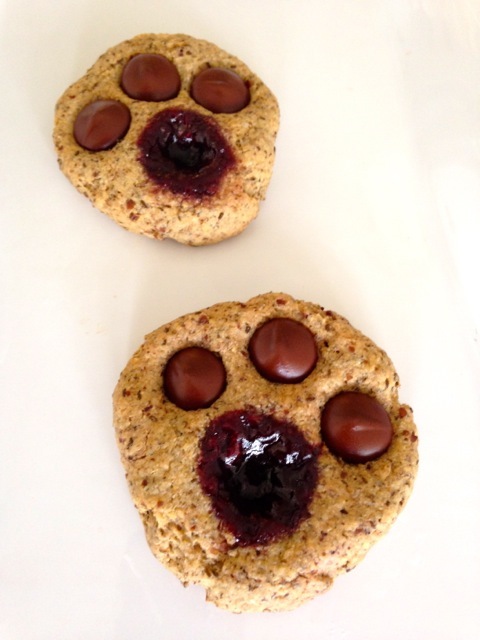 Only a child could take something as Martha-Stewart as thumbprint cookies and turn them into animal tracks! Or fossilized dinosaur footprints! Or birds’ nests! So take a cue from Big and have fun with this dough! And then enjoy these lightly-sweetened, whole-grain buttery cookies with a big glass of milk. Combine flour, flax, chia, baking powder, and salt in a large mixing bowl. Add syrup, butter, almond butter, egg, vanilla extract, and almond extract. Using a wooden spoon, mix well. Use your hands to knead it gently into a soft dough. Form dough into little balls and then flatten to make circles. Indent each cookie with your thumb or fingers. 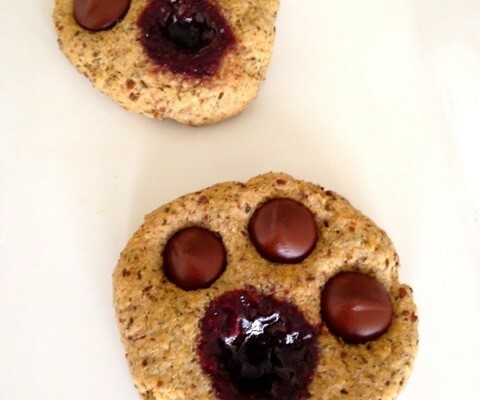 Place jam, dried fruit, or dark chocolate chips in the indentation. Bake 15 minutes, or until edges turn golden.